eBay is taking a direct jab at Amazon Prime Day by running its own exclusive deals day — eBay Deals — on the same day as the Seattle-based marketplace. It is touting the day as a “no membership-required” sale, and plans to match prices for eligible items if found somewhere else for less. A search engine that can easily find and recommend the desired products, along with one that can help consumers sort and parse through unwanted offers, could help one of the marketplaces become the one that is pulling in more dollars. eBay's sale day will offer thousands of new items that consumers want to purchase at up to 80% off their regular price. Improved search features in recent years aim to help consumers find what they need. 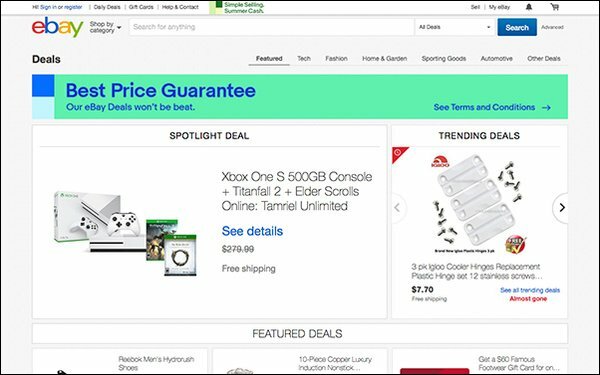 The company also highlights free shipping and a Best Price Guarantee service, meaning that if consumers find an item for less on an eligible competitor’s website, eBay will give them 110% off the price difference. Apple, Samsung, Adidas, Dyson, and KitchenAid are some of the participating brands. eBay will reveal the deals the week of July 16, but it has already begun to spotlight deals from specific brands. eBay has deals on brand new, in-demand inventory every day at eBay.com/deals, and has offered exclusive deals during previous summers. The marketplace has about 171 million active buyers worldwide. About 80% of all merchandise sold on eBay is new, and there have been 402 million downloads of its apps worldwide. The platform offers filter searches for items by one-, two- and three-day delivery through eBay Guaranteed Delivery. With 1.1 billion listings, eBay claims to offer the widest selection of inventory anywhere. It’s frequency of product purchases via desktop and mobile in the U.S. includes a watch purchased every five seconds, a smartphone purchased every five seconds and a tool purchased every four seconds. Still, in eBay’s latest quarterly earnings report, the company points to Amazon, Facebook, Google, Wal-Mart, Target and others as adding competitive pressure. The deals are running now, about 11 days ahead of Prime Day, with additional deals debuting on July 16. Amazon’s also enticing consumers to start a 30-day free trial just to participate in Prime Day.